John Gilbert believes that farming has a continued, prominent role to play in American daily life — in terms of the economic well-being and health, for both the land and its people. We were introduced to John through Niman Ranch, one of the nation’s largest collectives of traditional, humane, and sustainable family farms. John has been supplying pigs for Niman for the last 20 years, and was awarded the organization’s “Farmer of the Year” in 2017. Along with his wife Beverly, his son John C., and his son’s wife Sarah, John operates the 480-acre Gibralter Farms. 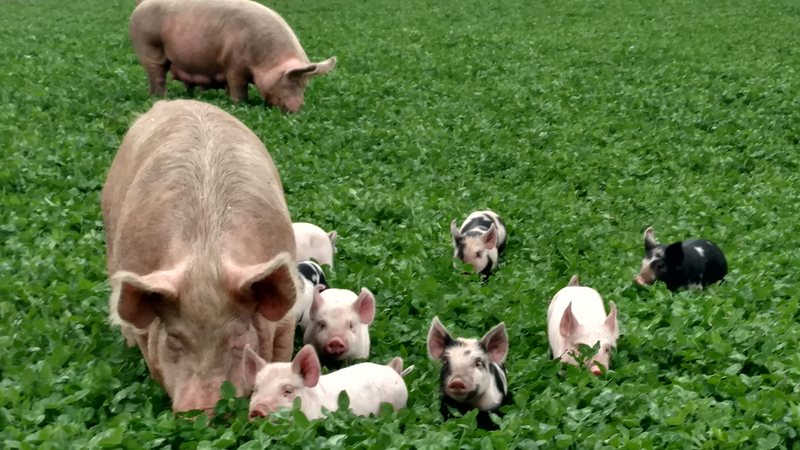 The Gilberts raise antibiotic-free, pasture-farrowed pigs, milk Brown Swiss dairy cattle, and grow an array of crops and forage. Their family farm sits along Southfork, a tributary of the Iowa River, near Iowa Falls, Iowa. Roam recently had a chance to interview John about his experiences raising pigs and running a family farm. As you’ll see, John has a powerful message to share when it comes to the role of modern farming in America as well as the importance of raising livestock humanely. Roam: Great to talk with you John, can you tell us a little about your family’s farming heritage? John Gilbert: I think my ancestors started out in Connecticut, went to the Finger Lakes region, and stopped in Wisconsin. Then — and I’m not sure why — but when they got to Hardin County in north central Iowa in 1869, they didn’t go any further. The farm has been in the family for more than 120 years. Midwestern agriculture has always been built around the dairy cow and the pig. Those are the two primary things that generated both food and income for a lot of farmers. That’s what we’ve always maintained here. Sometimes, we’ve had more cows, and sometimes we’ve had more pigs, but it’s still a formula that works for us today. Roam: How did you first become a Niman Ranch farmer? John Gilbert: I’m old enough to be a veteran of the farm crisis years in the 1980s. There were a lot of years when you weren’t worried about whether you were making money, you’re just trying to make sure you get the bills paid. And it was about then that we started raising a few pastured pigs — first as part of a 4H project — and one thing led to another. That was about 1998, and I’ve been working with Niman ever since. They’ve been a good partner. I’ve always really been impressed with their people and the level of dedication and perseverance a lot of them have to build something that we can all be proud of. Roam: Raising livestock humanely is part of being a Niman Ranch partner, but can you talk about why you think people are interested in humane and pasture-raised pigs these days more than ever before? John Gilbert: You look at the way most pigs are being raised today, and you realize that if industrialization had never happened, there’d probably be no Niman Ranch. I’m reluctant to badmouth industrialization, but the reality is that there’s a world of difference between our animals and most of whatever else is going on the market. If there wasn’t an awakening of consumer interest, you know, this market probably wouldn’t have taken off. The only thing that really bothers me a lot is that we’re getting about as much stratification in food availability as we do in economic distribution in the country. I worry that we are building a market that’s not available as widely as we’d like it to be. I also don’t think you can separate the problems we have in this country with healthcare and disease without realizing that a lot of consumers are eating proactively because they worry that one major health issue could put them into in a bankruptcy. There are people who aren’t sure that their insurance coverage is that good or there are people who don’t have insurance coverage for even minor issues. I think that there are some things that are motivating it more than just consumer preference, and I think one big one is fear of health problems and realizing that a lot of the things we eat today maybe aren’t the best for us. Roam: I know conservation is an important topic for you and your wife Beverly, can you talk about the importance of incorporating sustainable farming practices on your farm? John Gilbert: A wise man once told me that if you have a loss, it’s lost. You may find a way to compensate for a problem, but a loss is a loss. I’ve seen this too many times with the soil. If you have any kind of rain events, you’re going to have soil movement and soil loss. I learned a few of those lessons the hard way. With the soil, you can work the rest of your career and never really make up for the damage you can create in a few minutes. We have to do everything we can to make the soil better and keep the water cleaner. I feel we really have a moral obligation and that it’s our duty as a farmer to find the system where we can protect the land, produce healthy products, and still pay our bills. I’ve heard people complain that they can’t do conservation because it doesn’t pay well. In my estimation, you have a moral obligation to find a way to make it pay. There’s a lot of evidence out there that doing things like going to no-till, using cover crops, and having more than monocultures or mono crops can be more profitable. But there’s a certain amount of people in the in the farming business that, you know, think that “work” is a four-letter word. Roam: Why is it so important for you to raise your pigs in a humane manner? How can more farmers do sustainable or regenerative farming and avoid getting caught in the system of factory farms? John Gilbert: There’s an adage that democracy is the worst system of government devised by man… except for all the others. There’s an analogy that the modern hog confinement system is the best method to raise pigs, well, that is, except for all the others. I hate to use the word “greed,” but in a lot of ways, that’s kind of what it is. People think having money gives them economic clout, and we see that with the packers and this commodity-driven industrialization. Because of the factory farms, Iowa has seriously impaired waters that can be tied back to the concentration of hog manure and waste from industrialized farms. That system is not sustainable for the animal nor the rural economy. Because they have a lot of money to throw at politicians to subvert the democratic process, they get away with a lot of things. I don’t necessarily condemn an individual farmer for investing in one of those stall-based confinement systems, I just think he’s pretty short-sighted and that they are being misled by those who don’t care for the welfare of the pigs or the farmers. There are enough young people who want opportunities, and who are really interested in raising high-quality food the right way. There’s growing interest to do things the right way. There are opportunities to mentor younger farmers with programs through Practical Farmers and some other programs Niman is setting up. There is definitely a growing desire to have higher-quality food without having to rely on the confinement systems. Roam: It seems like you have wanted to raise pigs in a better way for the animals for a long time, can you go into some of the reasons why? John Gilbert: I’ve been around animals since I was a kid, but I really didn’t come to appreciate the souls of these animals until I left the farm and then came back. What amazes me is just how much these animals are sentient beings. We milk dairy cows, and they are probably some of the most wonderful creatures in the world. You learn a lot if you pay attention to them. I have a friend and fellow farmer who once told me that he really didn’t start to appreciate husbandry until he could look the animal in the eye. I think part of it was that when he had his animals in stalls, he was just looking at the back end of the animals, and literally couldn’t look them in the eye. Once we start seeing the animals as individuals and as beings, you know, several things happen. You realize that they have personalities and that there are differences from animal to animal. You can also pretty quickly learn that life’s a lot better if you can mainly work with animals that have pleasant dispositions. When it came to pigs, it didn’t take me too long to realize that you should be careful which breeding stock you select because you don’t want to be fighting with them all the time. If you pick your right animals, they are more docile and easier to handle, but also, they have a better life. We hope that contributes to having a better quality product in the end. I have to admit that there is a certain disconnect that you have when you finally get to the point to sell an animal, but that’s the business we’re in. We just want to make sure that they only have one bad day in their life if at all possible. Whether it’s from a moral standpoint or a practical standpoint, we realize that these creatures didn’t have any choice to be here. And so we’ve got a real obligation to make sure that they have a good life.